With February right around the corner it’s time to start thinking about that oh so sweet and romantic holiday, Valentine’s Day! With visions of cupid dancing in your head (and heart) why not put those thoughts of love and inspiration to pen and paper…declaring your passion in the form of a poem! 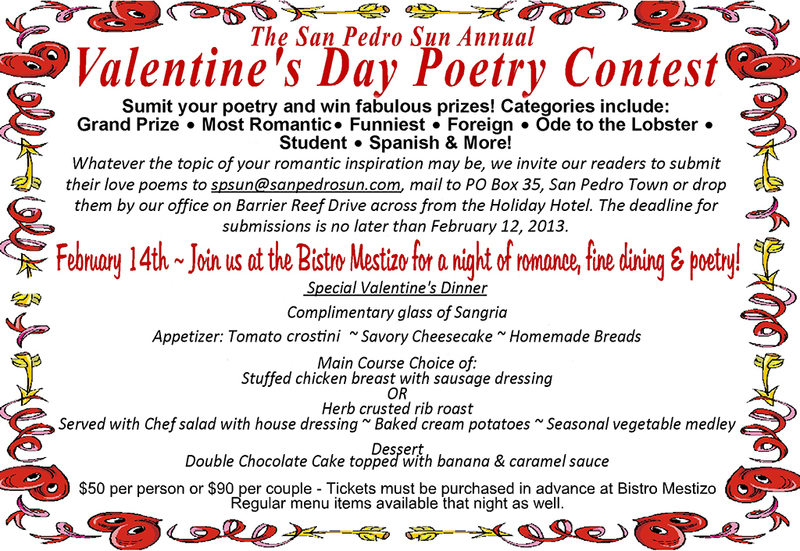 The San Pedro Sun is proud to announce our annual Valentine Poetry Contest, with fabulous prizes for poems of different categories, such as most romantic, funniest, Spanish and of course, the ode to the beloved lobster whose season closes on February 15th when the tasty crustaceans take a well-deserved honeymoon until mid-June. Poetry prizes range from one night stays at exotic resorts, dinners, golf cart rentals, gift certificates and much more! This year The San Pedro Sun is pleased to partner with Bistro Mestizo where the annual poetry reading event will be held on the evening of February 14th. The mood will be set with soft music, poetry readings and Ms. Shelly has planned a delicious Valentine’s dinner for those who want to seduce their taste buds while indulging in a romantic atmosphere. Tickets for the meal must be purchased in advance at Bistro Mestizo, located on Barrier Reef Drive in the heart of San Pedro Town. Of course their regular menu items will be available for order that night as well. Whatever the topic of your romantic inspiration may be, we invite our readers to submit their love poems to [email protected], mail to PO Box 35, San Pedro Town or drop them by our office on Barrier Reef Drive across from the Holiday Hotel. The deadline for submissions is no later than February 12, 2013. For more information please contact Tamara Sniffin at 226-2070. Valentine's Poetry Contest a romantic success!